the east side of the Genesee River. To reach Norton's Falls from the northeast side of Rochester: Follow Route 104 west to the North Clinton Avenue exit. Turn right (south) onto North Clinton Avenue and in 0.3 of a mile turn right (west) on to Norton Street. Follow Norton Street for roughly 0.5 of a mile and cross Saint Paul Street. Norton Street now becomes Seth Green Drive and curves to the north. To reach Norton's Falls from the northwest side of Rochester: Follow Route 104 east to the Seneca Avenue exit. Turn left (south) onto Seneca Avenue and follow it for 0.4 of a mile to Norton Street. Turn right (west) onto Norton Street. Follow Norton Street for about 0.7 of a mile, cross Saint Paul Street and continue onto Seth Green Drive as it curves to the north. Parking is available on the east side of Seth Green Drive, about 0.2 of a mile from Saint Paul Street. Please note that this is not an area to visit alone, and there is a lot of trash around. 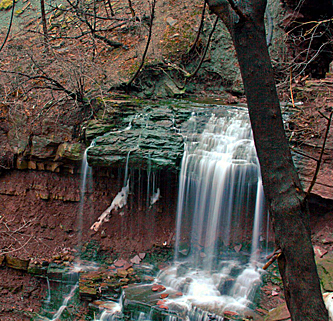 Norton's Falls is best seen in the early spring or after a period of heavy rain. The trail head, located near the sourhwestern end of the parking area, is plainly marked by a wooden sign giving some of the history of this area. Follow the trail northwards as it heads downhill into the Genesee River Gorge with the Veterans Memorial Bridge directly in front of you. The top of Norton's Falls is visible at the first switch back in the trail, roughly 1,500 feet from the trail head. Norton Creek flows from a stone culvert and over a 12 foot thick overhanging layer of Irondequoit Limestone. 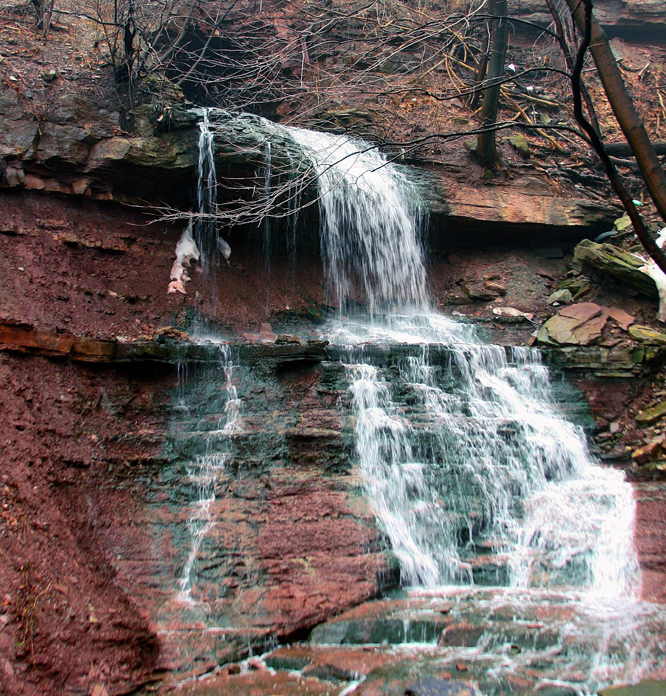 The creek free-falls roughly 15 feet and then cascades down another 20 feet or so over the reddish colored Queenston Shale. The waters then flow through a narrow boulder filled channel, down a gently sloping cascade and into the Genesee River. of the area click here. Copyright © 2009 by Scott A. Ensminger and Rich Engelbrecht.